Almost a year ago Microsoft introduced a file share technology called the Microsoft Azure File Service. Although it’s still in preview and you need to apply to it from within the Azure portal it offers the most convenient (and reliable) way to share directories and files between virtual machines in Azure. The Azure File Service adds powerful flexibility to the IaaS platform, especially when your application is highly scalable and needs to process and share a lot of files in a reliable manner. To setup a share you need to activate the Azure File Service. The best way to do that is to use the new Azure portal and sign up for the Azure File Service preview program. This can be done in the Azure Storage area. I received the sign up approval a few minutes later and the File Service was unlocked. That enabled me to select a file endpoint when I create a new storage. Once the new file storage account is configured it’s available for VMs, worker- and web roles, as long as there located in the same region where the storage account is hosted. That’s it. Now the user can access files and folders on the share drive. Account-, name and key and share name is available in the portal. I needed to grant the IIS application pool user as well as the IUSR access to the share. 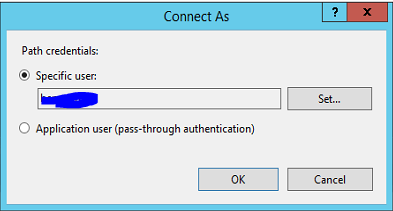 That was not that easy, because you can’t configure the ACL directly for the share. I could create a Windows user and gave it the storage account name and password, though. 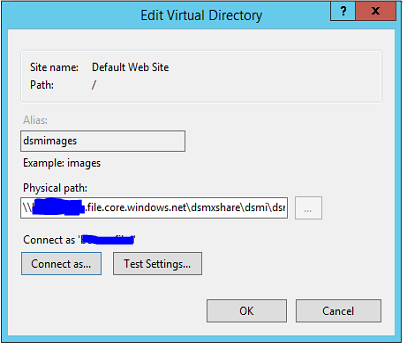 I assigned those credentials to the app pool identity and created a virtual directory in IIS, to which I used the same Windows user again to connect. I couldn’t access files using the drive letter path, but it worked pretty well using the UNC path \\<account name>.file.core.windows.net\<share name> instead.